Since ages, the story of Eklavya( a character from the Indian epic- Mahabharata) has come to define exemplary discipleship. But there is an unheard and unseen side to the famous story. Eklavya was the son of a poor hunter. He wanted to learn archery to save the deer in the forest that were being hunted by the leopards. So he went to Dronacharya (a master of advanced military arts) and requested him to teach him archery. Dronacharya was the teacher of the Royal family. In those days, as a rule, a teacher to the members of Royal family was not allowed to teach the state art to anybody else. It was forbidden to make anyone as powerful as the princes for the safety of the region. But Eklavya deeply desired to study under Dronacharya. Dronacharya, bound by the state law, could not accept him as his student. Eklavya in his heart had already accepted Dronacharya as his Guru. He went home and made a statue of his Guru. Over the following years, with sincerity and practice, he learnt archery and became better than the state princes at the art. He became so good at it that, he would hear the sound of the animal, shoot an arrow at it and claim the animal. Dronacharya was baffled and confused at Arjuna’s allegations. He wondered who this student of his was, who had learned the art from him but whose name and identity he did not know! He thought hard but could not come up with an answer for Arjuna. He could not believe, this student was better than even Arjuna. Both, Dronacharya and Arjuna decided to meet the boy. Eklavya welcomed his master with great honor and love. He led both of them to the statue he had made of Dronacharya. 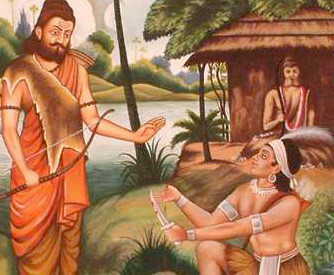 Eklavya had practiced archery over all the years, considering and believing the statue to be his Guru. In ancient times, a common practice in learning was- Guru Dakshina, where a student would give a token of gift or fee for the knowledge gained by the student. Dronacharya said, ‘Eklavya, you must give me some Guru Dakshina. You must give me the thumb of your right hand.’ Eklavya knew that without the thumb, archery could not be practiced. Eklavya without a second thought gave the thumb of his right hand to his Guru. In this story Dronacharya is commonly viewed as being cruel and self-centered. The perceived understanding is, this boy who has learned the skill on his own and is good at it, is made to give it up for the vested interest of Dronacharya. But when one looks at it from the point of view of the wise, one finds, if it were not for this incident, nobody would have ever known Eklavya. Though on the outside, it seemed as if Dronacharya had done injustice to Eklavya, actually Dronacharya uplifted Eklavya from just being a student to becoming an epitome of discipleship. Dronacharya blessed Eklavya with immortality by asking him for his thumb. So when people think of devotion, they think of Eklavya, and not Arjuna. How Diwali is Celeberated ? and other Event celeberated with Diwali.